Joe Cohen investigated opportunities to reduce peak demand and analyzed the return on investment. The Institute for Sustainable Energy Development enlisted Joe Cohen to evalute four high-rise apartment buildings and one high-rise condo, all owned and operated by the property management firm Draper and Kramer, for opportunities to reduce its peak demand. This potential load reduction could be used for emergency demand response (DR) purposes, where reduced demand is bid into the PJM Regional Transmission Organization capacity market, enabling the buildings to earn a year-round revenue source. Cohen worked with the buildings to help craft a load shedding strategy. He did this by figuring out what energy-intensive equipment could be easily be curtailed as well as what investments in smart-meter technology would be necessary to connect to PJM’s market. Cohen found that with the installation of a building automation system, variable frequency drive on the building’s main chiller could unlock further revenue potential by participating in both economic DR as well as frequency regulation. Finally, Cohen developed a financial analysis tool to evaluate the return on investment for these demand response opportunities. The tool was developed by compiling estimates on the costs of smart metering infrastructure as well as projecting all future revenue streams. 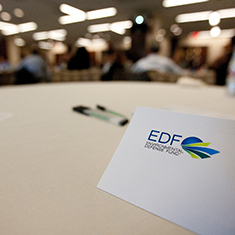 Joseph Cohen, a student at the University of Maryland, was hired as the 2013 EDF Climate Corps fellow at Institute for Sustainable Energy Development.